In the early morning hours of August 6, 2012, NASA’s Mars Science Laboratory also known as the Mars rover Curiosity will begin a harrowing descent through the thin martian atmosphere. For seven minutes, the fate of the $2.5 billion dollar rover will depend on a flawless performance by largely untested systems. Curiosity will plunge through the atmosphere protected first by its heat shield, then depend on the largest supersonic parachute ever used, and finally hope that landing sensors and radar, rockets, gyros, and a sky crane will all perform with precision to lower the small car sized rover to the surface. Getting something large to the surface of Mars is a challenge. On Earth, our thick atmosphere requires a robust heat shield and a proper trajectory to survive. Once you’ve made it through the frictional heat of reentry you can deploy a parachute and drift gently to the surface. 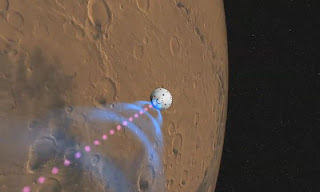 On Mars, the thin atmosphere and high entry velocity require a different tactic. You could parachute to Mars, but the greater the mass, the more challenging getting to the surface becomes in its thin air. Eventually, a parachute or inflatable bags just won’t work any longer. So the Mars Science Laboratory will require a combinations of technologies to make a successful touchdown. Launch and reentry have always been the most critical part of a spaceflight. It doesn’t matter where it occurs, the Moon, Mars, Titan, or Earth. Each planet or moon has it own nuances and all are dangerous. One thing we know for sure, that in the history of spaceflight, this moves to the top of the list for ambitious and dangerous reentries. However, back in the early day of the space program, there is a little remembered idea that involved sending an astronaut plunging back to earth in an emergency inflatable escape suit called MOOSE. It would have been the ultimate seven minutes of terror. In the alphabet soup of acronyms used by the military and NASA, MOOSE originally stood for Man Out of Spacecraft Easiest, but later became Manned Orbital Operations Safety Equipment. 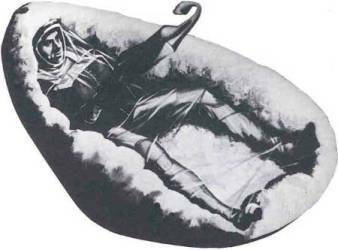 MOOSE was one of many inflatable heat shield concepts floated by the Air Force and NASA in the 60‘s. 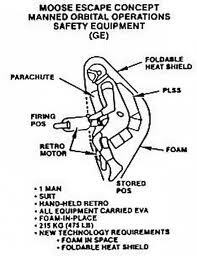 MOOSE was developed by General Electric, part of the early space program's rapid evolution of ideas for developing lightweight reentry capabilities. This particular concept was designed as an escape system for astronauts to free fall from a crippled spacecraft back to Earth. You heard right. It would have been the thrill ride of the space program, but high risk and incredibly dangerous. The idea started with the Air Force and its fledgling space program. It appeared that safety and the uncertain reliability of spaceflight required looking at creative options and the Air Force was looking for ways that stranded astronauts could leave a crippled spacecraft and return to Earth. There were concepts for multi-person inflatable lifeboats and then there was MOOSE. A single person rescue idea that fell out of favor as the space program matured and the Air Force’s own manned space program was abandoned. The nature of capsule spaceflight seemed to negate the need for a lifeboat. The cancellation of the Air Force MOL (Manned Orbiting Laboratory) and the absence of a NASA space station put the idea on the back burner. The MOOSE concept called for having a 200lb suitcase sized rescue package on board that would contain the inflatable lifeboat. The astronaut would suit up, inflate the escape pod using a cylinder of polyurethane foam and abandon ship. The foam is the same material you can buy at any home improvement store to use as insulation. After injection, the foam would harden on the interior on the heat shield and create a “form fitting” cavity for the astronaut. The pod contained small rockets that the astronaut would use to orient his makeshift reentry vehicle and begin the trek home. Once through the atmosphere a parachute would carry the astronaut gently to the ground. The MOOSE assembly carried signal equipment for tracking and dye packs for a water landing. The craft could land or ground or water. Imagine an astronaut retuning from space separated only by an inflatable heat shield, a spacesuit, and some poly foam. As the Air Force’s need dissipated for a rescue craft, NASA never seriously considered picking up the concept. Tight budgets and an uncertain future for human spaceflight post Apollo doomed the inflated reentry vehicles. It is interesting to consider the “what ifs” of MOOSE. Skylab, being only a temporary outpost never needed an emergency escape system. Coming out of the gate the space shuttle was to usher in the routine airline, “shirt sleeve” service to and from low earth orbit. In hindsight, NASA took a Titanic approach to the shuttle, in an emergency the shuttle WAS the lifeboat. The shuttle could stay on orbit and the next shuttle in the pipeline was likely already on the pad and could conduct a rescue. That assumed a shuttle flying every two weeks which matched the shuttle’s max on orbit time. The shuttle would never fly on its original turnaround schedule and space shuttles on standby ready to fly would turn out to be just a dream. By the time the shuttle’s flew, the original idea for inflatable rescue craft was long forgotten. In the American space program, accidents just didn’t happen, but it turned out they did. The idea of a shuttle crew abandoning ship was as foreign in 1981 as lifeboats were on the Titanic in 1912. An accident on ascent, like Challenger, had no options, but Columbia did. Unfortunately, the failure to research the foam strike led to a compromised thermal protection system and the eventual loss of the vehicle and the crew. It is easy to speculate that MOOSE on the shuttle might have saved the crew. MOOSE would have been the absolute option of last resort with no guarantee of success and a terrifying ride for each astronaut. Facing space as they fell back to Earth and aside from their spacesuit, the astronaut would have witnessed the harshness of a fiery reentry up close. 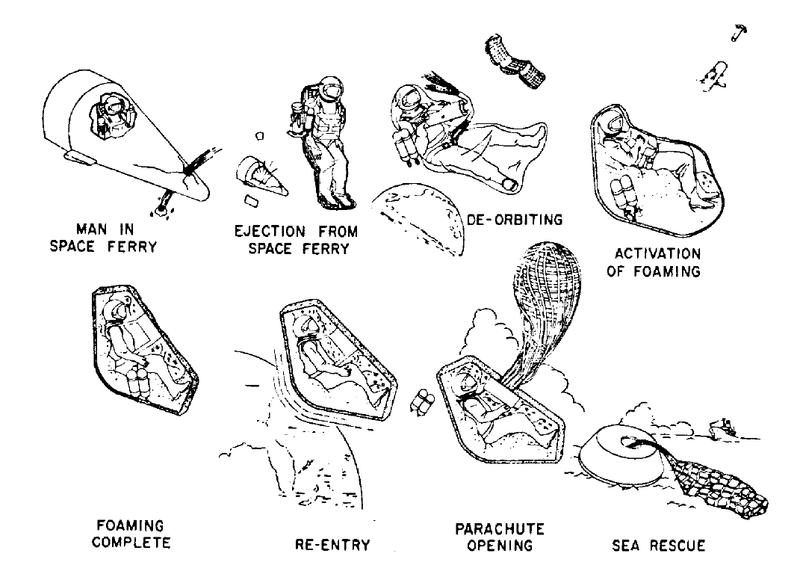 Inflatable reentry vehicles weren’t just a far-fetched idea, but a concept that had been vetted and deemed feasible, but maybe not practical for human use unless there were no other options available. The current record for free fall is 102,800ft set by Air Force pilot Joseph Kittinger in 1960. Adventurer and skydiver Felix Baumgartner took another step towards jumping from space by plunging from an altitude of 18 miles over New Mexico in preparation from his planned free fall from 23 miles to break Kittinger’s record. Hardly space, which officially begins at about 60 miles, If successful, Baumgartner would succeed where others have failed and would have braved -70 degree temperatures and breaking the sound barrier with only his pressurized suit to protect him. Skydiving from space in a MOOSE type configuration could one day become the next private space flight adventure. While MOOSE never made it to space, the idea of ballutes, inflatable heat shields, aerobraking, would see a resurgence. Just last week, NASA successfully tested its Inflatable Reentry Vehicle Experiment (IRVE-3) from the Wallops Flight Facility. The aeroshell was packed into a 22 wide Black Brant rocket and upon separation was inflated with nitrogen to 10ft. The IRVE-3 survived speeds of 7600mph and landed in the Atlantic off the North Carolina coast. NASA believes it will be the method of choice for taking humans in a craft from Mars orbit to the planet’s surface. NASA invested $17m on the IRVE-3 development and test. In the early sixties, the Air Force had seeded its program with more than a million dollars, enough to spur competition, but it would go wasted for decades. Now, what’s old is new again and a variation of the idea that was way ahead of its time fifty years ago may yet take human from space to the surface of a planet. That planet just might be Mars. 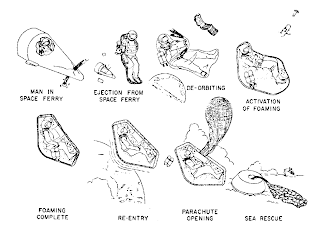 Read more about the original MOOSE and other space rescue concepts in this August, 1970 Technical Report contracted by NASA on "Guidance and control aspects of abort from manned spacecraft".